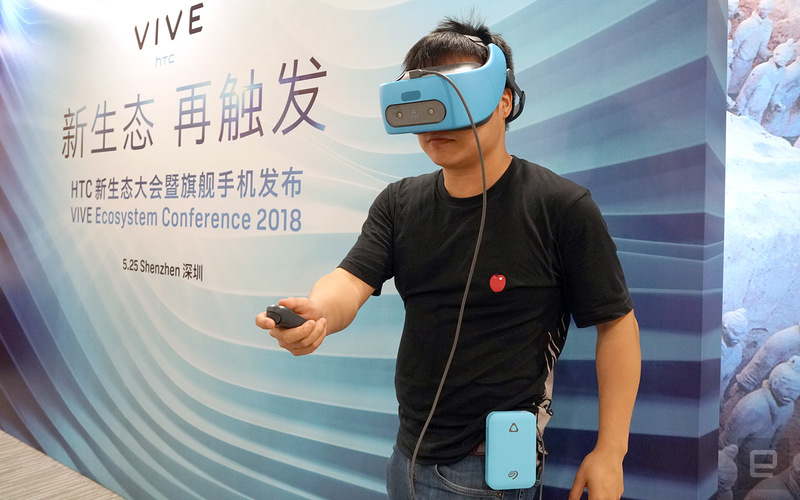 In addition to the major software update for the Vive Focus standalone VR headset yesterday, HTC also unveiled the Seagate VR Power Drive which, as the name suggests, is a hybrid of a power bank and a portable hard drive. This isn't an entirely new idea, of course, but it's the first of such kind designed with VR usage in mind. Specifically, this device packs 5,000 mAh of battery juice -- almost doubling that of the Vive Focus -- plus 1TB of storage space (but no speed specs yet), and it has a detachable belt clip which can be locked at every 90 degrees. Warpped around the main body is a built-in micro-USB cable with a USB-C adapter at the end (thus making it compatible with a larger range of gadgets, especially smartphones for data backup purposes). This can then be plugged into an extension cord, with its L-shaped USB-C plug going into the top of the Vive Focus. The total length of the cables is obviously made just right, so that it doesn't get in the way of one's arms or legs. What's disappointing is that while the VR Power Drive is pitched as a two-in-one solution, it's actually not able to offer both power and storage access simultaneously; you have to flick a switch to toggle between these two modes. I also wish that Seagate will offer a different color option because, well, HTC Vive's signature blue isn't exactly the most fitting color for a fanny pack-like accessory (let alone a headset, for that matter; at least it has a white option). Hopefully Seagate can address at least one of these concerns before the VR Power Drive's Q3 launch -- a likely time frame for the Vive Focus' upcoming global rollout.